Bronx Park, New York 58, N. Y. This is a valuable book for the bromeliad student and will serve to identify the bromeliads from Mexico to Panama and the West Indies as well as in the U. S. A. A Florida magazine, "Tropical Homemaker and Gardener" of Miami, has featured bromeliads in their last two issues. In the March, 1957, issue an article by a Florida West Coast Brom. Soc. 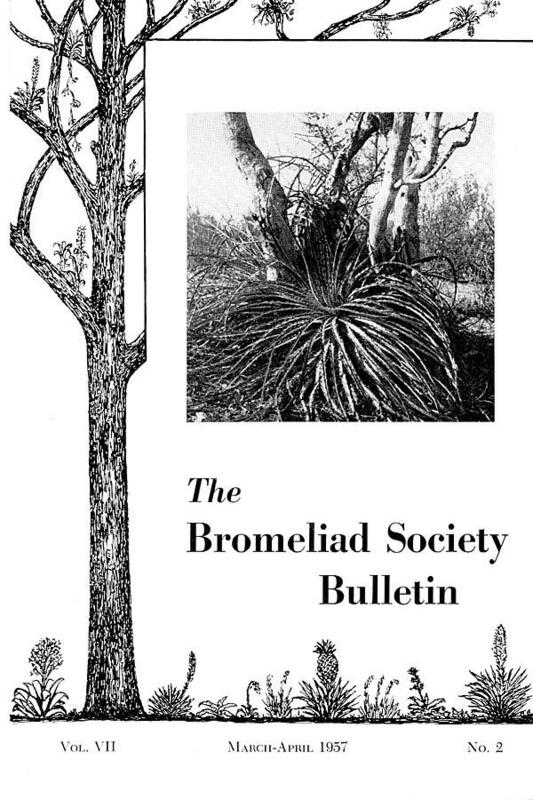 member, E. H. Palmer, appears under the title, "Bromeliads Are So Exciting!" Five photographs add much interest to this excellent article. This same magazine, in their April, 1957 issue, reprinted the article on historical aspects of the pineapple in print by Wyndham Hayward from the Brom. Soc. Bull. May-June 1956. In a Brazilian publication, "Tribuna Farmaceutia", Sr. Carlos Stellfeld, Director of the Parana Museum, Curitiba, has written a paper, "Bromeliaceas Paranaenses" in which, among others, he tries to establish validity for the Acanthostachys exilis of Bertoni instead of the accepted, Ac. strobilacea. We regret to announce that one of our Directors, Mr. Morris Schick, passed away April 7th. He was close to 90, but was still active in his little nursery. He was one of the first in California to offer bromeliads, having been in this business for almost thirty years. We are sad, as he was a gentle, sweet soul and everyone was very fond of him. While this issue is on the press Mulford Foster is collecting bromeliads in Mexico; and he is sure to have something to write home about! 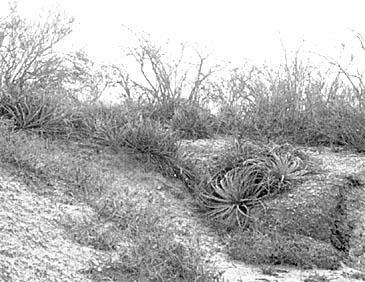 THE COVER: Hechtia Ghiesbreghtii as it grows in the arid land of low hills a short distance from the Rio Grande River, Texas. On April 20, 1950, my husband, Morris, and I were returning with friends to Brownsville from Laredo, Texas – the last lap of a successful plant collecting trip in Mexico. We had planned on a slow, plant-scouting drive home, but the illness of one of our party necessitated a change in plans and speed became our prime objective. Not much plant detail can be picked up when scanning the roadside from a rapidly moving automobile so I was not devoting my entire attention to this task – which makes it all the more amazing that the brief image of large, purplish, whorled clumps of plants registered "bromeliads" on my mind. So far as I knew at that time, terrestrial bromeliads were unknown in this part of Texas, so I disliked to ask for even a slackening in speed on such dubious evidence. Instead, I concentrated for some time on the rapidly vanishing roadside with every trick we had acquired on our plant collecting expeditions. Suddenly, and so unexpectedly that I was startled, one of the plants came into sharp focus for a fleeting moment and I spoke excitedly and rather wonderingly, "Why, those really are bromels! Please slow down for a few minutes." But, alas, no more plants appeared, for I had delayed speaking too long and we had driven out of the range of the species. At home, we checked into all of our information on terrestrial bromeliads and decided they must be Hechtia, but could find no record of a species with purplish leaves. Two species of this genus were reported from Texas, but who would dream of finding them this close to the coast? We talked endlessly all summer about the plants but did not have the courage to brave the heat of those semi-barren hills until cooler weather. Finally, about the middle of November, we made the return trip and had no difficulty at all in locating our plants – in Starr County, about 12 miles west of Roma – for the hills were simply covered with them. They were, indeed, Hechtias – acres of them! They were immense plants, a few up to 4 feet in diameter, and were growing in huge clumps. Seen at close range, I soon discovered why they had looked purplish to me in April, for the leaves were heavily stained bright purplish red at the tips and along the edges. There would have been even more color in April, after the long dry winter. We wandered around for some time, admiring the plants and trying to locate specimens which were small enough to take home. Most of the plants were undoubtedly very old and we thought it very strange that there were no seedlings at all and very few small plants, but this is often true in arid or semi-desert areas. The Hechtias were a little "choosy" as to where they grew for we found few plants at the top of the hills and none at all at the bottom. Most of the largest and prettiest plants were about half way down the western slope of the hills but we could not decide just why some were colored so beautifully while others nearby had little color or none at all. Perhaps it takes a fine balance of light and moisture (or lack of it) which varies from plant to plant. The gray-green leaves of this species are very numerous, from 15 to 30 inches or more long, recurved, slightly or much whorled, and are armed with large, vicious, reddish-brown teeth. The dried inflorescences were 6-10 feet tall, well branched at the top. We looked for seed, but the capsules were either empty or riddled with weevils. We found the habitat of the plants more fascinating than one would at first suppose. Located just a short distance from the Rio Grande River, it is an arid land of low hills sparingly covered with scrub trees, thorny shrubs, Yucca, cactus, Agave and a few annual and perennial herbs. The hills in this immediate neighborhood were composed of shale in various stages of decomposition and we were astonished to find that the shale was in reality the remains of immense petrified oyster shells. Large pieces and a few worn but whole shells were found in some of the drains – the largest measuring over a foot in length, around 5 inches in width and extraordinarily thick. We were reminded that there is a petrified forest not far to the north of this location and remembered that geologists believe that this section of Texas has been inundated by the sea at least five times. The scrubby habitat of this Hechtia in the remains of petrified oyster shells. We spent the better part of the day in the area – exploring, photographing the plants and digging some of the smaller ones to take home. A few of the plants and part of a dried inflorescence were sent to Mr. Foster, who tentatively identified the species as Hechtia ghiesbreghtii. The following April we returned to our collection spot, hoping to see the plants in bloom. It was a little too early in the season for just a few stems were found, just emerging. We were horrified to find that entire hillsides of plants had been demolished by bulldozers and we suddenly realized that the section inhabited by our plants was well within the site for Falcon Dam, at that time in the initial stages of construction. We thought grimly of the many acres of beautiful Hechtia destined to be flooded and lost forever. 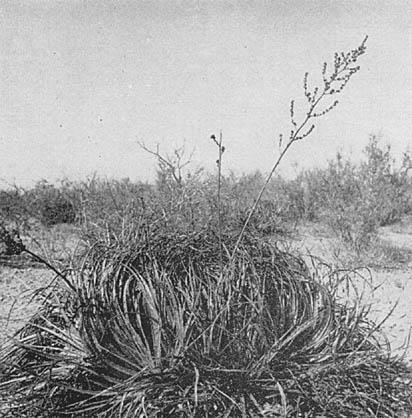 However, our fears were not entirely realized and we are now happy to report that only a portion of the plants have been lost to progress, for we have found that the range of the species extends northward to a greater extent than we had originally supposed as well as westward into Zapata County. Hechtia ghiesbreghtii takes very kindly to cultivation here in Brownsville – either in pots or in the ground – if plenty of drainage is supplied, ample sunshine furnished, and only enough water is given to prevent the leaves from burning. Under these conditions the plants seem happy and color up beautifully, bloom well each year and increase naturally by suckering at the base. Of course, our soil here is alkaline, but I feel that the species is so adaptable that plants would make themselves at home in many sections of the country if extra calcium were supplied where the pH required it. As to frost resistance, plants in their native habitat have withstood temperatures of at least 12 to 15 degrees Fahrenheit. The Epiphyte House at the Montreal Botanical Garden. The official opening of the first section of our large conservatory complex in September 1956 represents an important step forward in the development of the Montreal Botanical Garden and in our services to the public. Until now, our rather exceptionally fine collections of tropical plants had been crowded in 25 service greenhouses where they could neither develop their full beauty nor could be seen by the general public. The whole conservatory layout is to be completed within the next 3 years and will then cover with glass an area of 67,000 feet. The first section comprises a 86 × 69 ft. center house in which flower shows will be held, as well as two wing houses each of which is about 100 ft. long and 34 ft. wide. One of these latter houses contains a display of epiphytes – mainly bromeliads but also some orchids, peperomias, aroids, etc. – which have been established on tree trunks covered with osmunda and cork bark. We realize, of course, that in the humid atmosphere of this greenhouse the tree trunks will not last longer than perhaps two years, but the exhibit had to be ready for the date of the opening so that we could not prepare anything more permanent. The time was too short to obtain the iron pipe – at present in short supply – which we intend to use eventually to construct altogether artificial trees. It should not be difficult to imitate with iron pipe the natural branching habit of a tree, and, once the pipes are covered with osmunda fiber and with large pieces of tightly fitted cork bark, nobody will be able to tell the difference. The epiphytic plants will certainly not mind either, and such an artificial tree should last for many years. For the time being, we are delighted with the results obtained, and the Montreal public is fascinated by the rich jungle scene which has thus been created and which most have never seen before. Calatheas in many species as well as large Anthuriums and Philodendrons, Dieffenbachias, etc., are planted out on the ground between the trees with Cryptanthus, Fittonias, Episceas and others forming a groundcover, and it is a pleasure to see how they all enjoy their new root freedom. Calatheas especially never succeed well in a pot but after being planted out they are now getting more beautiful almost from day to day. The bromeliads, which before had been kept in pots in an overcrowded greenhouse, luxuriate also in the airspace and better light conditions they have gained, and they flower more freely than ever before. One clump of Aechmea filicaulis, a species which Mr. Foster and I brought with us from Venezuela in 1951, has at present 9 of its startling 5 ft. long hanging inflorescences in flower and is much admired by visitors. Several species of Billbergia, Aechmea, Guzmania, Tillandsia, etc., are in flower also. One plant of Oncidium macranthum, obtained from Senor Strobel in Ecuador has produced a huge inflorescence which drapes a whole long branch with its large, golden yellow and purple hanging flowers. Altogether 83 species of bromeliads have been included in this display. Thanks to the kind help of Mrs. Racine Foster, we were able to obtain from Florida an ample supply of "Spanish Moss" (Tillandsia usneoides), and this adds the finishing touch to the picture. Our new conservatory is heated by high vacuum steam which prevents sudden and frequent fluctuations in temperature, and the epiphyte house is kept at 70° F. during the day and 60° F. at night. We are now contemplating to install also a humidification system which will maintain a steady humidity of 70 to 75°. At first this will be set up on a trial basis. For the time being we have no real control over the humidity which is maintained merely by spraying. The additional sections of our conservatory complex which are still on the drawing board will include among others a large tropical house 146 × 80 ft. and 49 ft. high in which we intend to plant a much more complete jungle scene, including palms, bamboos, etc. from the various tropical regions of the world. Other houses will contain cacti, ferns, aroids, the Australian flora, the flora of southern South America, the Mediterranean flora, etc. The aquatic house will provide a large basin for the Victoria regia and other large tropical water and bog plants, while the walls of the basement below it will be furnished with built-in aquaria which are to accommodate a collection of submerged water plants together with tropical fishes. So, we and the Montreal public still have a good deal to look forward to. The members of the Bromeliad Society will undoubtedly be interested in learning from the above outline that our first choice for a spectacular display were bromeliads which definitely dominate in our epiphyte house, and that this has been a complete success. For a large majority of the Montreal public this has been the first introduction to these strikingly handsome plants, and it can be expected with confidence that the newly aroused interest will spread and grow. So far, no bromeliads are offered for sale in the florist shops of our city, though cacti and aroids are in great demand. This picture is bound to change as soon as people realize that bromeliads not only are handsomer than either of the others but also are easier to accommodate in the average home. A corner of the Taylor's home. Although a row house in a city, with no greenhouse and no place for one, does not afford anything like ideal conditions for growing bromeliads, our collection of these plants has done well enough to give us considerable satisfaction. During the summer a number of them are placed outdoors, on the front porch and by the steps, planted in groups in window boxes or large pots, or potted individually; some of the latter are plunged in window boxes filled with peatmoss. In cold weather space indoors is very much at a premium; most of the plants are closely grouped around the two lightest windows on the first floor, those not shaded by porches, one in the living room and one in the dining room, facing east and west respectively. The living room window is especially tall, seven feet. There are shelves across at several levels, and plant stands of different heights nearby; also there is a hanging basket in each window. One basket contains Billbergia Theodore L. Mead and Acanthostachys strobilacea along with a Hoya and an Episcia, the other holds some small Cryptanthus plants among an assortment of trailers. Last winter it was necessary to find room for some of the plants next to the bedroom windows upstairs; and this year, with a still larger group, I am about to set up fluorescent lights over a table in the basement to provide winter quarters for the overflow. Because of the proximity of buildings and tall trees, light is the chief problem. Even in the most favorable position outdoors, such Billbergias as distachia and Saundersii hyb. do not color, and not being partial to the stiff upright form I have disposed of them. So far bloom has been scant; the selection has been mainly on the basis of attractiveness as foliage plants, the color and pattern of markings, and graceful form, being the qualities looked for. The backbone of the collection consists of about twenty Aechmeas (including maginali and some additional "discolor" kinds, among others) and a dozen Neoregelias (marmorata, spectabilis, and some of their hybrids, being the showiest). There are also about a half-dozen each of Billbergia, Nidularium, and Cryptanthus; this last genus in the main does not flourish here, possibly wanting higher humidity. There are a few Vriesias; for a while I had handsome plants of fenestralis and hieroglyphica, until I lost them to base rot from injudicious watering during a prolonged spell of very humid weather. 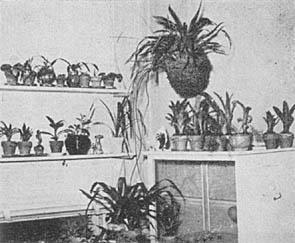 The remainder of the collection includes two Billbergia-Cryptanthus bigenerics, and two or three kinds each of Dyckia, Guzmania, and Quesnelia. The total of sixty or seventy varieties, species and hybrids, is less impressive than it may sound; in many instances there is only one plant of a kind, and a number are less than full size. We have, as well, some plants not in the bromeliad family, but not nearly so many. Don't hesitate to repot plants as you get them from the nurseries. The grower may use a potting medium not ideal for your conditions; and in order to pot firmly, he may have planted too deeply and so invited rot or at least discoloration of the leaves. Go easy on watering, especially when plants are semi-dormant, when humidity is high, and temperature low. I've lost plants by drowning, but never from drought. If possible, empty out occasionally the water standing in the leaf-cups and replace with fresh. By absorption and evaporation of the water, unabsorbed dissolved matter may in time become concentrated enough to damage the foliage, and debris settling in the leaf bases may invite rot. Limited observation indicates the thinner-leaved plants to be particularly susceptible to injury. Don't be in too great a hurry to remove side-shoots; the bigger they are, the better the chance of survival. Safest time is in the season of active growth; if roots have started, so much the better. Bromeliads cannot be packed like Sanseveria or Cactus! We have received bromeliads that were ruined beyond decorative value for at least a year, because they were so badly packed. Mr. Hugh Evans of Evans and Reeves Nurseries, Los Angeles, has said, "So often we receive plants which appear to have been thrown into a box from a distance of several feet away." Since we have packed bromeliads successfully for about twelve years we feel that we can speak with at least familiarity on the subject. Moreover, we constantly receive letters praising our packing jobs, the comments usually ending with "you would never know they had ever left your greenhouse!" And from Hugh Evans, again, "I can't ever remember receiving plants which arrived looking like they came from across the street." While this may appear to be tooting our own horn a little loudly, we submit it only in considerable concern over the increasing number of bromeliads that are being received in poor condition. We find that it is best to let the plants dry off a day or two before packing, first having poured the water and debris out of the spaces between the leaves; then perhaps a good washing off if the leaves are dirty; dried dirt can be easily removed by rubbing with a dampened cloth. After tying the roots in a lightly moistened medium – NOT a wet sphagnum – they can be left to drain and dry a day or two. We do not recommend very wet roots for shipping. In general, bromeliads do not care to have water confined to their roots for any length of time in a pot or otherwise, least of all when their roots are wrapped in a waterproof paper; the heat in transportation is conducive to rot. The process of packing should be thoughtful. Bromeliads are a fountain of leaves piling up from an open central well. The very nature and form of the plant has dictated to us the best method of packing; the rosette form of the leaves means that there is space between each leaf and they are somewhat stiff, so if they are crushed together (as happens when carelessly packed) the leaves are bound to crack and become damaged in numerous ways. So, we pack with a "shock-absorber" in between the leaves and in the center well. That is, we place layers of shredded paper or crumpled tissue paper between the leaves, and a cone of twisted tissue paper in the center well, so that the leaves are held in an open position just as they grow. This means, also, that the spines on some of the more serrated ones do not have a chance to scar other leaves. After placing plenty of shredded paper around the plant we then roll the whole bundle in a rather tightly turned cornucopia of newspaper. Thus, each plant is wrapped separately, and by packing each of these bundles tightly together in a box they have no chance to move or rub each other. We have had 99% success with this method. Another simpler method, but successful, is rolling the plant in a flexible tube of corrugated cardboard, so that each plant is an individual cell. Generally, this means that the plants must stand up in the box, a factor which consumes more space. But, whatever procedure you use, for gratifying results, treat the bromeliads like a piece of china! I have read with great interest the various methods of seed sowing which have been described in several issues of the Bromeliad Bulletin. I wonder if the method I have evolved would be of interest to any of your members? For Vriesia and Tillandsia seeds, the most satisfactory results have been obtained from planting seed in finely chopped tree-fern fiber. The fiber is poured into a rather shallow, flat tin (e.g. a herring can) just as if it were soil. It is then moistened thoroughly, if it is not damp already. The seed is then spread over the surface of the fiber, and sprayed with water from an atomizer, to fix it properly. The tin is then placed in a warm, shady situation, and kept constantly moist through regular sprayings. Surplus water drains away through holes in the bottom of the tin. As the seedlings appear, this treatment is continued, although with more care being taken in order to prevent the seedlings from being unduly disturbed. A modification of the above method was suggested to me by Senhor Richard Doering. This works almost as well, and has the added advantage of minimizing the time spent in watering the young plants. You can use the salmon tins (this time without the holes in the bottom), but instead of chopping the tree fern fiber, merely cut a small slab of fibrous bark, big enough to fit comfortably in the can, and extend a fourth or half inch over the top. The can is then filled with water to about half or three-fourths of its depth. When the fiber is saturated the first time it will soak up all the water in the can; sow the seed and fix it by spraying as before. Then keep the can filled with water to about one half or three-fourths of its depth as you did before. You will need to add water every day in warm weather, slightly less often in the cooler months. With this method you do not have to worry about watering the seedlings out of the ground, as all the moisture seeps up from below. I find that loosening the fibers with a knife before soaking assists the rapid assimilation of water, as well as making it easier for the seedlings to gain a foothold later on. For Aechmea seedlings (the only non-Vriesia type ones I have tried so far) a mixture of punga fiber (tree fern) which is crushed, vermiculite, old cow manure, leaf mold, and very rich loam gave excellent results. Vermiculite and sand accounted for about 10% of the mixture, the rest being made up of equal parts of the other ingredients. This is also kept moist by overhead spraying every day or two. Germination and growth seem quite rapid and satisfactory. So thought some chewing insects also, much to my annoyance, and my first crop of Aechmea Mariae-Reginae seedlings were eaten up almost entirely. These culprits were an army of malicious insects visiting the collection by night. Fortunately they left my precious Vriesias alone! All my plants are grown out of doors, most of the bromeliads being planted in a sheltered, warm position, or housed in a "bush house" made of tree-fern trunks and manuka (Leptospermum) brush. The seedlings are placed on a warm verandah, which is not enclosed, but sheltered from the prevailing winds. I have no glasshouse, but I suppose this would be necessary for raising seedlings in a less favorable climate. I find that the best germination and growth takes place in the warmer months, November-April here, (May-October in your hemisphere). During the other six months the weather is unsettled, and very wet. Our summers are very hot and dry; the maximum (mean) for December-January, February-March varying from 80-85°. Our winter (July-August) temperatures are in the 60s during the day, and rarely fall below 45° during the nights, although there is an occasional drop to 30° resulting in frost. However, over an area of even one and a half acres it is possible to pick out areas which are permanently frost free! May I conclude by congratulating you on your very fine Bulletin which I continue to enjoy. P. S. I would like to correspond with others interested in exchanging seeds of bromeliads for New Zealand and Australian seeds of plants and trees. Besides bromeliads I am very interested in cacti, succulents, aroids, ferns, and tropical plants generally. Also politics, education and the arts! 1. Bromeliads seem to do better, especially to reproduce better, if they are set deeply into the potting material, so lower leaves disintegrate and the stem is exposed by the removal of these leaves. 2. Bromeliads do not seem to make good growth if any restricting device, such as wire, cord, or rope crosses the lower leaf area. If fastening bromels to bark, tree trunks, etc., it is best to fasten the restricting band just at the point of junction of roots and rhizome-like base of plant. 3. Old outer leaves are removed, not only for the sake of appearance of bromeliad plants, but also to encourage the development of "pups" or offshoots. 4. Use dry milk, non-fat, in solution as recommend on package, to clean leaves of plants. 5. Clean and sterilize pots before re-using. The Florida West Coast Bromeliad Society exhibited "A Florida Bromeliad Garden" at the Florida West Coast Orchid Society's Ninth Annual Show, at The Municipal Pier, St. Petersburg, on January 19, 20 and 21, 1957. 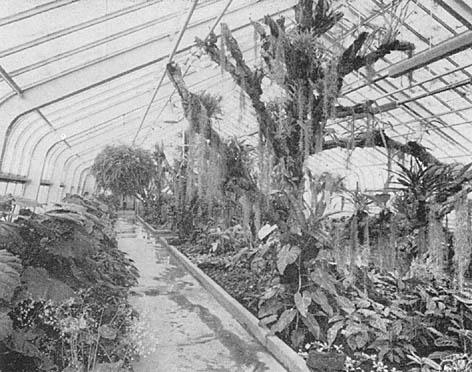 An area of 30 feet long by 10 feet deep was transformed into a complete garden of epiphytic and terrestrial bromeliads. The central area was an irregular shaped lawn of Zoysia grass, surrounded by a walk of white limestone gravel. Behind this, to each side, and in a narrow strip part way across the front, Spanish Moss was laid down in a thick layer, potted bromeliads were sunk in to the tops of the pots, and brown peat was sprinkled thickly between plants. Each plant appeared to be growing in soil, and the rich dark brown peat brought out all colors of the bromeliads to perfection. A large Sabal Palm in one corner carried numerous Tillandsias and Billbergias, in flower, on its trunks. In the opposite corner was a large Sugarloaf Pineapple with a ripening fruit, surrounded by several smaller pineapple plants. In the foreground of the large palm was a rock out-cropping with various Cryptanthus, Cryptbergia, Tillandsia, and Billbergia species growing in the crevices and-erosion holes. Clumps and individual rosettes of many bromeliads, from large to small, a good proportion in flower or fruit, filled the remainder of the beds. A row of young Melaleucas and small Areca palm clumps formed the back boundary of the garden. Our members approached the problem of setting up this exhibit with some uneasiness, as it was decided to try to use exclusively plants grown in this area. In past years we had relied heavily on Mr. Foster for the loan of plants, but we hoped both to relieve him of the burden and to demonstrate the size and quality which our own collections have now reached. Much to everyone's surprise, we had far too many plants and had to take some home, rather than crowd the exhibit. There were 17 genera and 75 species, varieties and hybrids represented, and most of them by several, or even many, individual plants. Our committee, Mrs. Harry F. Klein, chairman, assisted by Mrs. Jos. Appleton and Mrs. George Van Duesen, deserve the credit for planning, organizing, and making all the arrangements for our exhibit. The plants were judged, most ably, by Mr. Ed Ensign, Mr. Julian Nally, and Mr. John Hall, who kindly drove down from Orlando on our behalf. The exhibit attracted many people and several joined our society. It was highly acclaimed by the viewers, and in the newspapers, and we feel our first "solo flight" was a fine success. Fla. West Coast Brom. Soc. One peculiarity of this family is its limited distribution. All bromeliads are natives of the Americas. Their occurrence is, of course, limited by climatic conditions – temperature being probably the main factor, and light and humidity to a certain extent being another cause. Humidity is especially important to the epiphytic species that cannot survive prolonged periods of dryness. Only a few species have managed to adapt themselves to drought and cold and have been able, due to their resistance to adversity, to penetrate regions where winters are felt. Tillandsia usneoides, with astonishing adaptability, has spread most widely. Mez called it the character plant of the tropical Americas, being known from Florida to northern Chile and Central Argentine. The territorial limits of the distribution, according to Harms, is from 38° north in eastern Virginia to 44° south in Chile. It is doubtful whether bromeliads can exist beyond these limits. The genus Tillandsia contains the most adverse – tolerant species – and are the pioneers of the tribe. We can only form a vague conception of the various growing conditions existing in such a vast area. One might say it is unnecessary for the practical grower to concern himself with all this and that a mere knowledge of simple cultural requirements is all that is needed to grow bromels profitably. To attain a fair success in growing bromeliads it is not absolutely necessary that the practical grower know everything pertaining to them; but to reach perfection, this knowledge of their peculiarities, demands, and preferences should be his. Location, situation, and climate form the plant. By looking at a plant, noting its appearance and condition, the experienced grower can usually tell with some certainty its cultural needs. A study of their natural growing conditions – of where they grow and their situation – indicates the rudiments of cultural requirements of bromeliads to a greater degree than with any other plant group. These natural growing conditions are very diversified, depending upon available light, wind, temperature, the form and amount of atmospheric precipitation – be it rain, fog, or dew – the form, size, color, and structure of the leaves and the density of the scale covering are to the largest degree expressive of the climatic conditions. The above indicated enormous area – its north and south extent limited by temperature, and its east and west borders by two oceans and maritime currents, and, finally, by the temperature affected by altitude – fosters an amazing variety of forms, which often grow in such large masses as to give the landscape an aspect of its own. Every district has its typical representatives, which are sometimes widespread and which are sometimes limited regionally. Many species are inhabitants of the tropical rain forests. These forests cover, for the most part, the vast expanses of the lower Amazon basin and are the concept of "the forest primeval." The larger part of this forest is water-covered during March and April, twice yearly in the lower regions when the rivers reach flood stages. So bromeliads have taken to the trees, and here grow most of the epiphytic species. The rain forests of Brazil, influenced climatically, vary regionally very much. They shelter an enormous number of species and forms. A great many of the horticulturally valuable Vriesias have their home there. They are not too heat demanding, a part of the territory being outside the tropical belt. To know this is of special importance to the grower. The main forms of the rainforest bromels are the soft-leaved leaf-tank types, unarmed and without scales. The greater number have magnificently colored inflorescences. Their light requirements are comparatively low, situated as they are below shading leaf-crowns and foliage masses. Bromels inhabiting the Catinga region, with its limited rainfall and thorny bush growth, have contrastingly stiff, well-armored leaves. Aechmeas, Ananas, Bromelia species, and others grow there. These plants are pronounced sun lovers, are very drought-resistant, and are, for the most part, terrestrials. These character qualities should be well considered by the grower. The third group to be considered is that of the Savannas, a park-like landscape with extensive grassy plains, small tree groups, and large single trees. Their temperature is that of the rain-forests, but the strong prevailing wind exercises a major influence and the humidity is subject to great variation. All bromels native in this region are either epiphytic or grow upon isolated rock formations. All are very drought resistant and are able to regulate their water intake by various means; for instance, by a specially dense scale covering or by large capacious leaves. The grower must consider that these bromeliads are often exposed to strong light, the trees being less dense and often deciduous. All these various regions intergraded, are more or less pronounced, inhabited often by special forms not mentioned here. These climatically conditioned zones reappear in more condensed form in Central America, inhabited by similarly influenced forms of vegetation. The epiphytic species are best able to overcome the manifold adverse conditions and are represented in greatest numbers. Elevation forms a growth limit at about 12,000 feet in the South American Andes of Peru, Brazil, and Argentina. There Puyas are predominant, attaining often a gigantic size. Again and again it should be realized that growth regions are seldom sharply defined. They are fluent, and transition zones are numerous, influencing growth and forms and presupposing an adaptability within wide limits. This is indeed the case. The total effect of these climatic factors with narrow limits has produced conditions for existence that have formed highly selective species among the bromeliads and strictly limited their occurrence to restricted zones. This explains in part the difficulties sometime met with in their cultivation, their failure to do their best if individual needs are disregarded, neglected – due chiefly to lack of knowledge. Ever humid regions – rain forests. More or less dense shade, unvarying high temperature, light air movement. Tropical regions with pronounced dry periods. Chapparal-like regions, covered with thorny bushes. Strong to very strong light, more or less dry spells. Considerable variation in humidity, periodical moderate temperature variation, moderate to dry high temperatures, frequent strong air movements, with low temperatures occurring in the savannas.